UFC Denver hosted a ledger of exciting fights throughout to make the 25th Anniversary show truly special. Barber started out on Dana White’s Tuesday night Contender Series where she won a grinding decision over Jamie Coleen to win herself a UFC contract. This fight followed suit as Barber stopped Hannah Cifers at 2:01 of the 2nd round to get a home state win. She had issues making weight for this fight but with it behind her now the goal is to make the proper preparations for future weight cuts. She called out fellow rising star Mackenzie Dern in her post fight interview. Both fighters had recently competed in the LFA together but a match up never materialized. Maybe we will these two women face off in the near future. Donald Cerrone taps Mike Perry with an arm bar. Cerrone managed to secure the arm bar while being slammed to the canvas by Mike Perry and breaking records at the same time. The victorious Cowboy raised his son in the air Lion King style and now has twenty one victories inside the Octagon, a new company record. He also passes Vitor Belfort and Anderson Silva for most finishes in UFC history (15). Easily the craziest moment of UFC Denver belongs to Yair Rodriguez. He was on the receiving end of a methodical beating at the hands of the Korean Zombie. 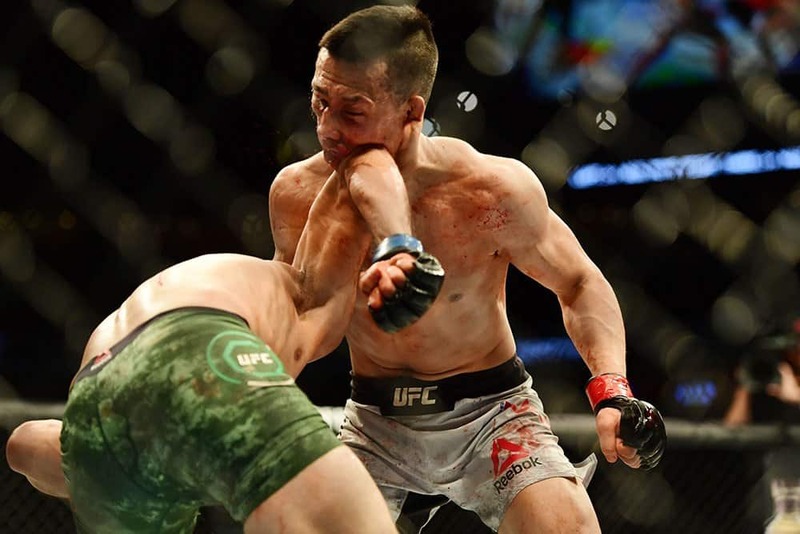 He had taken abuse in every area of the game and Chang Sung Jung had won himself a clear Unanimous Decision victory until Rodriguez dipped and a drove an elbow behind his back. Rodriguez had taken this fight on short notice after Frankie Edgar withdrew from the match up with an injury. The knockout nabs the Knockout of the Year for me. Rodriguez fell to the canvas moments after elbowing his opponent and sound of the bell. He had to be held upright to give his thoughts on the fight.